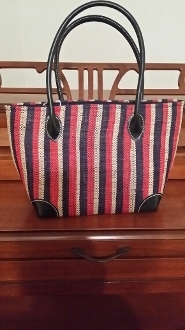 Madagascar Rafia Bags. Sewn with soft raffia and other grasses . Faux leather handles. Protective corners. Coordinating cloth lining and drawstring closure. Made from sustainable raw materials. Red/White/Blue Stripes. Large: 16.5" x 7” x 14.5"